By the time the first public performance of Beethoven's Symphony No. 3 ('Eroica') took place in Vienna in 1805, a privileged few had already heard the work at a private play-through at the Lobkowitz Palace in June 1804. This release brings to life the momentous day that prompted the great Haydn, Beethoven's teacher, to remark 'everything is different from today'. A film that keeps you glued to the screen from beginning to end even if you don't like classical music. It is a film about a day that changed Western culture, not just music. It put thought into music. Classical music is no longer just for pleasure or, worse, for background, but it is a means of expression for ideas and ideals. In a way, no film can possibly be expected to convey such an enormous feat, it's too important, too far reaching an event to encapsulate in 83 minutes. Acting is quite good, and so are the costumes. Of course the symphony itself if always a pleasure to listen to. In this case it's Gardiner conducting. One small inaccuracy is that when he learns that Napoleon crowned himself Emperor Beethoven is shown as ripping the title page off, with the famous dedication to Bonaparte, and throwing it away. In fact, he crossed out the words, ripping up the paper in doing so. 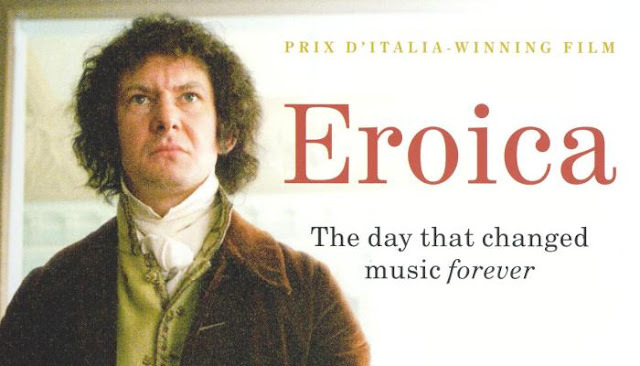 In the UK buy your favorite version of Beethoven's Eroica here on Amazon.